Author: Obadiah. Very little is known about this man, whose name means "servant (or worshiper) of the Lord." Dare written: Possibly during the reign of Jehoram in Judah, 855-841 B.C., or possibly during Jeremiah's ministry, 627-586 B.C. Setting: Historically, Edom had constantly harassed the Jews. Prior to the time this book was written, they has participated in attacks against Judah. Given the dates above, this prophecy came after the division of Israel into the northern and southern kingdom and before the conquering of Judah by Nebuchadnezzar in 586 B.C. Special features: The book of Obadiah uses vigorous poetic language and is written in the from of a dirge of doom. Not to be confused with: Eleven other men in the Old Testament, including an official in charge of Ahab’s palace (1 Kin. 18:3–16). Best known today as: The prophet whose vision of the Lord’s judgment on Edom is contained in the shortest book in the Old Testament. Word in life study Bible . 1997, c1996 (electronic ed.) (Abd 3). Nashville: Thomas Nelson. I. The Doom of Edom (vv. 1–14). A. The Humbling of Proud Edom (vv. 1–4). B. The Thoroughness of the Slaughter of Edom (vv. 5–9). C. The Reason for Edom’s Destruction (vv. 10–14). II. Edom in “the Day of the Lord” (vv. 15–21). A. The Judgment of Edom and Other Nations (vv. 15, 16). B. Israel’s Place in “the Day of the Lord” (vv. 17–21). 1. Salvation and Riches (v. 17). 2. The Destruction of Edom (v. 18). 3. The Enlargement of Borders (vv. 19, 20). 4. The Lord and Those Who Reign with Him (v. 21). New Geneva study Bible. 1997, c1995 (electronic ed.) (Abd 1). Nashville: Thomas Nelson. Served as a prophet to Judah possibly around 853 B.C. Edom was a constant thorn in Judah's side. The Edomites often participated in attacks initiated by other enemies. God will judge Edom for its evil actions toward God's people. Just as Edom was destroyed and disappeared as a nation, so God will destroy proud and wicked people. 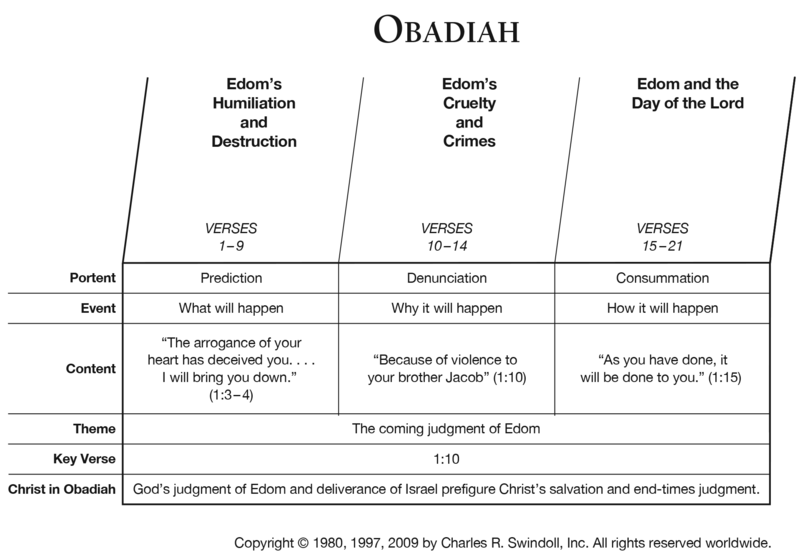 The book of Obadiah shows the outcome on the ancient feud between Edom and Israel. Edom was proud of its high position, but God would bring her down. Those who are high and powerful today should not be overconfident in themselves, whether they are a nation, a corporation, a church, or a family. Just as Edom was destroyed for its pride, so will anyone be who lives in defiance of God. Israel's kings had constant conflict with Edom.